Scott last appeared as Beadle Bamford in SWEENEY TODD and as Nicely, Nicely in GUYS AND DOLLS. He recently co-starred as Sancho with Jon Cypher in MAN OF LA MANCHA, a role he repeated with John McCook for South Bay CLO. 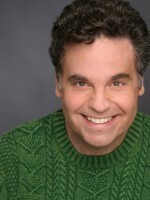 Scott spent 9 months performing in and musically directing the LA company of I LOVE YOU, YOU’RE PERFECT, NOW CHANGE, and appeared in the LA company of RADIO GALS, repeating the role at the Coconut Grove Playhouse in Miami. Scott enjoyed sharing the stage with Carol Burnett in the world premiere of the new musical, FROM THE TOP for the Long Beach CLO, and was a series regular in the CBS dramatic series WIOU. Scott has appeared Off-Broadway in the revival of ON THE TWENTIETH CENTURY, and in the National Companies of DO BLACK PATENT LEATHER SHOES REALLY REFLECT UP?, and THE ROCKY HORROR SHOW. Movie roles have included Stan Licata in Risky Business and Ralph Andropwicz in the Sidney Lumet film Power opposite Richard Gere. Television credits include guest starring on High Incident, China Beach, Good Advice, Wiseguy, The Adventures of Brisco County, Jr., Buffy, The Vampire Slayer, and the NBC MOW, A Hollywood Marriage. His arrangements can be heard on the album “Randy Graff sings Cy Coleman”. A popular studio/session singer, Scott can be heard on a number of jingles, and on Electra/Nonesuch’s release of “Lady Be Good”, SONY Music’s recording of “Paris In The Spring” written by Leslie Bricusse, and in Disney’s animated films A Goofy Movie, and Pocahantas II.